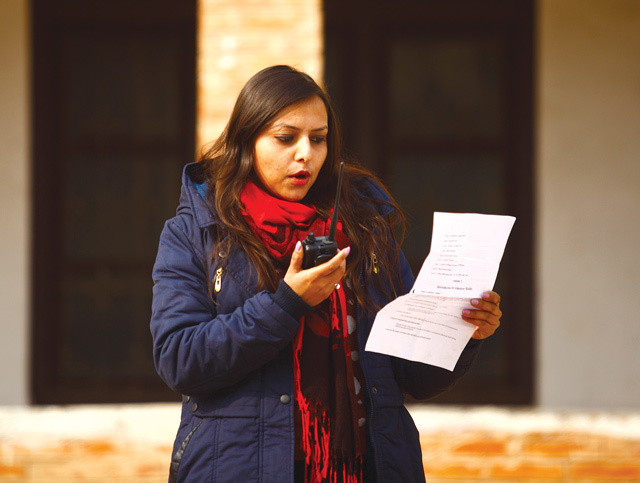 HAM OPERATORS: Laxmi Khanal is one of 20 female ham operators in Nepal. As phone lines were jammed and the internet went down in Nepal after last April’s earthquake, the only way Manju Sunar could find out if her daughter was safe was to ask an amateur radio operator in France, where she worked, to contact another radio hobbyist in Nepal who then sent people out on motorbikes and found Sunar’s daughter safe. Amateur radio enthusiasts, called ham operators, can speak to each other across the world through shortwave transmitters. The 2.5 million licensed operators communicate through voice or the Morse code, a method of sending messages in a series of electronic pulses. With additional equipment, operators can even attach files and send emails through radio signals alone. Though primarily taken up as a hobby, these devices become crucial in times of disaster when all other modes of communication fail as happened in Nepal, or during the Asian tsunami in 2004, when ham radio operators coordinated rescue. “We probably helped search and rescue over 400 people,” says Pravin Joshi, a ham radio operator in Kathmandu. Ham radio was introduced in Nepal by Marshall Moran, a Jesuit priest who established St Xavier’s School in Godavari in 1951. Over 50 years later in 2005, there were only five operators in the country. However, the number now has risen to 105, most of them based in Kathmandu. “There is an increasing interest amongst Nepalis in ham radios not just as a hobby but also as a means of communication during emergency. People have now understood its value,” says Laxmi Khanal, a media professional, who is one of 20 female operators in Nepal. Last April, Satish Kharel worked with operators with ham enthusiasts in India, Portugal, Israel and elsewhere to answer questions about earthquake survivors. As soon as the earthquake struck, many Nepali ham operators worked to locate and rescue survivors. Some of them went to hospitals every day to receive lists of dead and injured persons so that they could answer queries from relatives and friends around the world. Satish Kharel is a well-known lawyer, but few know that he has been a licensed ham operator for over two decades. Last April, he worked with operators not just within Nepal but with ham enthusiasts in India, Portugal, Israel and elsewhere to answer questions about earthquake survivors. “During power cuts, I connected the radio equipment to my own car battery and got it to work,” Kharel recalls. Operators in Kathmandu were at first at a loss when they started receiving queries about people at the epicenter in Barpak, as the village was cut off for many days. One amateur operator, Ravindra Mul, went to Barpak with his transceiver and battery, hung a dipole antenna on a tree and stayed in a tent to answer questions. Though ham radios helped in search and rescue efforts, experts say their role was, unfortunately, limited. The ham radio station at NSET-Nepal, an organisation that specialises in earthquake preparedness and recovery, broke down when it was most needed. 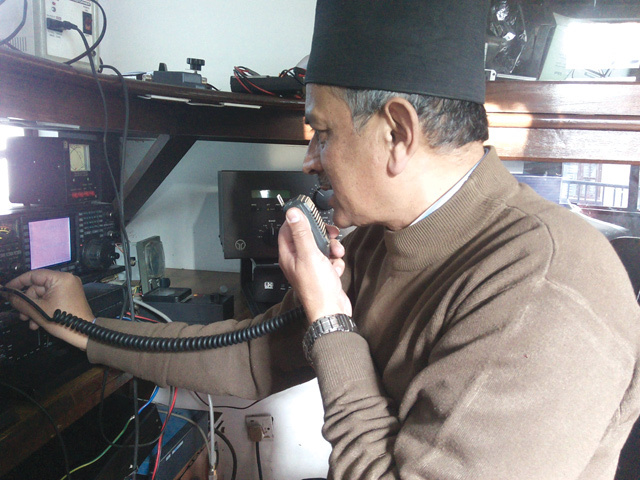 Anil Upadhyay, who oversaw NSET’s communication after the earthquake, blamed the lack of training and poor practice for the inability to utilise ham radio. “We didn’t have a separate person in charge of overseeing ham radio operations,” he admitted. There is little support from the government. Many countries now host annual ‘field days’, amateur radio drills when operators are trained to coordinate search and rescue in mock emergencies and trained to make ham radio more effective and useful. We asked an official at the Ministry of Information and Communications if the government has any policies to promote the use of ham radios in Nepal, especially during disasters. But it didn’t seem like much thought had been put into it besides conducting license tests for interested operators. The Ministry had stopped license tests in 1998, citing security concerns during the Maoist conflict. Joshi is active in organising awareness programs on the uses of ham radio, and this week he will set up an event in which school children will communicate with astronomers at the International Space Station through a ham radio transmitter in Kathmandu. He admits that amateur radio was seen to be a slightly expensive hobby in the past. But the cheapest equipment can now cost as little as Rs 10,000. The International Ham Amateur Radio Union also subsidises equipment for enthusiasts in many countries including Nepal. So you want to be a Ham Operator? They were developed long before the internet, but ham radios continue to draw loyal followers from around the world. Queen Noor of Jordan, King Juan of Spain and Bollywood superstar Amitabh Bachchan are some famous names who have taken up this hobby. Ham radios have helped coordinate rescue and relief in emergencies such as the September 2001 attacks, hurricane Katrina and the Haiti earthquake. Faster transmissions are now being developed so that operators can send any form of digital data through radio signals. With more advanced equipment, operators can also locate the GPS of their fellows during emergencies. Today operators are also involved in creating their own gear, participating in contests and even trying their luck at tough tasks such as using the moon or a meteor trail to bounce off their radio signals. In Nepal, Satish Kharel and his group of operators are helping Nepal Police set up, and train them to use, ham radios for emergency situations. Amateur radio enthusiasts must apply for a license at the Ministry of Information and Communications and sit for a written test that consists of questions on everything from electromagnetic theory to applications of ham radio. They will then be tested on the Morse code. Prospective applicants can reach out to Kharel at [email protected] for help with testing preparations, use of equipment and for other information.